In 1571, Christianity was saved at the Battle of Lepanto. In the 16th century, a strong and aggressive Muslim force was poised to conquer the European continent. Their goal was to wipe out Christianity, “to place a crescent on top of St. Peter’s and a turban on the pope’s head.” In response, Christians banded together, turned to Mary, invoked the Rosary, and were saved when God gave them a victory at one of the most famous naval battles in history. The battle took place just off the coast of Greece at a place known as Lepanto; the year was 1571. 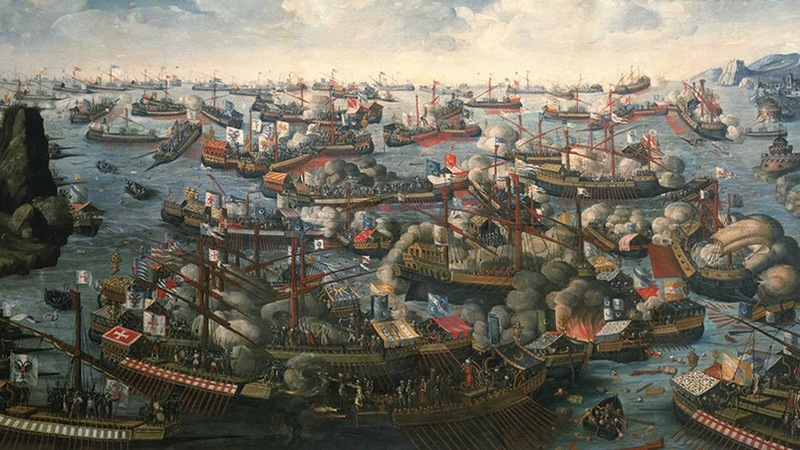 The opposing forces were a strong, well-trained and seasoned Ottoman Turk navy led by Ali Pasha and a loosely connected Christian fleet called the Holy League, led by a Spaniard named Don Juan of Austria and Admiral Marcantonio Colonna. The bloody battle that ensued would impact the course of history. In 1453, the Turks captured Constantinople, the center of Christianity in the Eastern world. Less than a decade earlier at the Ecumenical Council of Florence (1438-45), representatives of the Eastern Church had accepted the primacy of the pope and language of the Western Church regarding the Holy Spirit (filioque) in the Nicene Creed. These issues had long separated the two churches. The concessions by the East were largely made to obtain military help from the West against the growing menace of the Ottoman empire. This was a major breakthrough in the division between Catholics of East and West, but was short-lived. Not everyone in the Eastern Church accepted the actions of their representatives at Florence, and as no agreement was ever consummated, the issues were not resolved. Moreover, no Western armies moved to protect Eastern Christians. It was only a matter of time until Constantinople fell. After Constantinople, the Turks turned toward the western Mediterranean and Europe, conquering areas in the Balkans, Greece, Ukraine, North Africa and the Middle East in the mid-to-late 16th century, threatening all Christianity. They gave no quarter to any people or country, reveled in the spoils of war and committed widespread atrocities, especially against Christians. The Turkish military was well led, well organized; their navy was growing into one of the most feared among all nations. In the Church of Rome, an unlikely leader surfaced in the person of Michele Cardinal Ghislieri, who in 1566 became Pope Pius V. He didn’t want the job as the Holy Father and upon installation reportedly said: “With God’s help, I will try to govern so that the public’s grief at my death will be even greater than their grief at my election.” He would become one of the most effective popes of the Middle Ages and in 1712 was canonized by Pope Clement XI (r. 1700-21). As the reign of Pope Pius began, the Christian world was in chaos. In Germany the Protestant Reformation was on fire, in France the Huguenots were fighting Christians, and England was rejecting Catholicism. The Council of Trent (1545-63) was recently completed, and the pope was confronted to act on and implement the many decisions of that ecumenical council, including a revised Roman Missal, a breviary and a catechism. While Pius took on all these challenges, he had the God-given wisdom to recognize the Ottoman Turks as the biggest concern of the time. The most recent victory of the Turks had taken place at Famagusta, Cyprus, in early 1571. For months the populace of Famagusta, which was under Venetian rule, had held out against a siege by the Turks. Finally, when food supplies were exhausted, the city negotiated a ceasefire with the Turks, who agreed to the safety of the citizens. However, when the Christian leaders were brought before the Turkish military, some were beheaded, some tortured; atrocities were committed against the populace and many became slaves. Hearing of another Ottoman victory and the cruelty imposed on the people, Pope Pius recognized that Europe was in line of sight of the Turks. He began in earnest to organize a Holy League, a crusade of European nations against the Muslim force. Unfortunately, many countries wanted to remain neutral; only Spain, the Papal States and Venice offered serious resources, while other states provided limited support. All combined, the Holy League consisted of 208 ships and 68,000 soldiers, sailors and oarsmen. The Muslim force had 282 ships and 87,000 men including oarsmen; the majority of their oarsmen were Christian slaves. In 1569, Pius V had issued a papal bull, Consueverunt Romani Pontifices, which set the universal standard for praying the Rosary. As the sea battle between the Christians and Turks loomed, Pope Pius asked Christians throughout Europe to pray the Rosary, seeking the intercession of the Blessed Mother with her Son for a Christian victory. The pope also ordered churches to conduct continuous periods of Eucharistic adoration. He prompted the Rosary Confraternities in Rome to hold processions during which the Rosary was prayed. The faithful of Europe were all fervently praying at the same time for the same purpose: to save Christianity. Every Christian soldier and sailor aboard the Christian vessels prayed the Rosary on the eve of the battle and had received the Eucharist before sailing. The Oct. 7 battle lasted some five hours with the ships fighting in close proximity. The Turks had the edge in numbers, but the tactics, total guns, leadership and Divine Providence won the day for the Christians. When the battle was over, the Turks had lost 20,000 men and 200 ships. The Christian losses were less than 8,000 men and only a few vessels. By the grace of God, Christianity was saved. Stories are told that Pope Pius was conducting business in the Vatican while the battle raged and at one point dispensed with what he was doing and announced that the Holy League had won a great victory. Official announcement of the battle results did not arrive in Rome until many days later. People were jubilant, Church bells rang and joyful praise was given to the Blessed Mother for her intercession with Our Lord Jesus. Soon the pope added a feast day, Our Lady of Victory, as an obligatory memorial to the Church calendar, celebrated every Oct. 7. 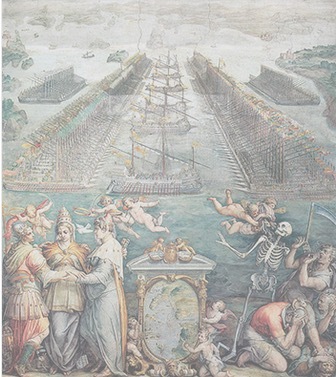 The victory at Lepanto and the intercession of the Blessed Mother garnered from the faithful praying the rosary, would thus be perpetuated in Catholic memory. The name of the feast changed over the centuries and became known by the current title, Our Lady of the Holy Rosary.